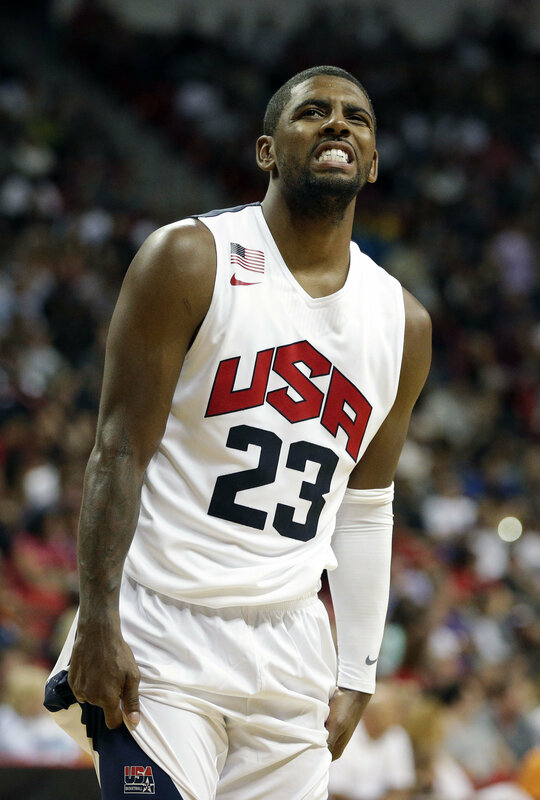 When we heard the news that Indiana’s Paul George had suffered a major leg injury during Friday’s scrimmage with USA Basketball it reinforced our belief of club over country. We understand that injuries can happen at any time (see Winslow, Kellen) and that this is the first major injury suffered by an NBA player since they started playing on the national team in 1992, but we’ve never been worked up if a Cleveland player is passed over for an All-Star game or for an international competition. It certainly is a nice honor for a player, but from a fan perspective we never saw the value in it. Why do we need to see Kyrie Irving (who has enough trouble staying on the court as it is) or LeBron James spend the off-season putting extra miles on their bodies? Or watch Joe Thomas or Alex Mack at the Pro Bowl, just waiting for someone to accidentally roll up their leg and blow out a knee? How did playing in the World Baseball Classic work out for Vinnie Pestano? It is a sentiment shared by others, most vocally by Dallas Mavericks owner Mark Cuban. “We are so stupid that we are willing to commit what amounts to more than a billion dollars in salaries to help the Olympics line their pockets so we can pretend that the Olympic Games are about national pride,” Cuban has said in published reports. Cuban isn’t the only person in the NBA to question if these type of competitions are in the league’s and players’ best interests. An (unfortunately) unnamed GM pulled no punches in an article by Adrian Wojnarowski. It will be interesting to see how this plays out. All it will take is one high-profile NBA player to take a pass on playing with the national team because they fear an injury for it to be OK for other players to follow suit. Once that happens, it wouldn’t be too hard to see the NBA and/or the players pushing for an age limit on the national team or other changes that would put younger players on the squad. Would that mean the U.S. may miss out on a gold medal here and there? Possibly. Club over country. That’s what we are most concerned about. For those Cavs fans in the “get Kevin Love” camp, Aug. 23 may be a special day for you. (Unless it is Aug. 24). According to a story in the Pioneer Press, the Timberwolves are trading their All-Star player on one of those days. “I’m saying it’s most likely because Kevin has made it pretty clear that that’s what he wants to do,” Minnesota owner Glen Taylor said. Those calendar dates coincide with the end of the 30-day moratorium on the Cavs including first-round draft pick Andrew Wiggins. As for Wiggins, he has quickly learned the business side of the NBA despite not even playing a game yet. We’ve hit August and while it is disappointing that the Cleveland Indians haven’t followed up last season’s playoff appearance with a better showing this season, it probably shouldn’t be that surprising. The Tribe sits one game above .500 following today’s extra-inning win over Texas, which is realistically what they were the past two seasons if it were not for a couple of statistical abnormalities. In 2012, a historically horrible month of August left the Tribe with a record of 68-94. Last season, the Tribe road a hot streak in September to finish at 92-70. The Tribe probably wasn’t as bad as their record would indicate in 2012, but neither were they as good as their record in 2013. In truth, they were probably nothing more than what they are this season – a .500 team. That helps explain why it wasn’t worth getting too worked up about the Tribe trading starting pitcher Justin Masterson and shortstop Asdrubal Cabrera at the trade deadline on Thursday. Neither was playing all that well – helping to contribute to the disappointing season – and the Indians were not resigning either player once they hit free agency after the season. It was too bad, however, that the Tribe couldn’t find a way to get Nick Swisher out of town, but with his onerous contract that is more fantasy than reality. It also doesn’t help that Swisher has no home runs and just six RBI since the All-Star break, and is batting all of .217 since coming off the disabled list. Oh well, there’s always next year’s trading deadline.